While Madrid is now a modern city in every sense of the word, its leaders and residents have gone to great lengths to preserve the look and feel of many of the city’s historic neighborhoods and streets. Its must-see landmarks include the Royal Palace of Madrid; the Royal Theatre, complete with its restored 1850 Opera House; the Buen Retiro Park, founded in 1631; the 19th-century National Library building (founded in 1712) containing some of Spain’s most treasured historical archives; a large number of national museums; and the Golden Triangle of Art, located along the Paseo del Prado and comprising three art museums: the Prado Museum, the Reina Sofía Museum, a museum of modern art, and the Thyssen-Bornemisza Museum, which houses several pieces reflecting the style and age of the other two museums. Located along the banks of the Manzanares River, Madrid sits at the center of both the country and the Autonomous Community of Madrid, an area that comprises the city of Madrid, its conurbation and extended suburbs and several smaller towns and villages. Being the capital city of Spain, Madrid serves as the political nexus of the country: the seat of the Spanish government and home to the Spanish monarch. It is also the economic and cultural hub of the country. Madrid is a fun and fascinating city to visit, largely because of its friendly people, warm weather, laid-back lifestyle, delicious cuisine, exciting night-life, and its world famous festivities and folklore. In a city that is so culturally rich, there is never a shortage of sights and attractions to behold. Whether you are taking in its many famous landmarks and museums, attending a bullfight or exploring the city’s rich history, you will always find something enjoyable and enriching to visit in this beautiful city. In the following article we will highlight several of the coolest things to do while visiting this great city, including an in-depth description of every activity and attraction. Located very close to each other in the heart of downtown Madrid, the Golden Triangle of Art is made up of three internationally-renowned art museums: the Museo del Prado (Prado Museum), a national museum featuring pre-20th century art; the Museo Nacional Centre de Arte Reina Sofía (Reina Sofía Museum), also a national museum, home to modern art of the 20th century; and the Museo de Arte Thyssen-Bornemisza Museum (Thyssen-Bornemisza Museum), a private museum featuring both historical and contemporary art. Of these three museums, the Prado Museum is by far the most popular and well-visited. The Prado has an expansive collection with a variety of works, including major collections from the artists Goya and Velasquez. The highly-acclaimed museum is one of the most-visited attractions in Madrid, summoning the attention of lovers of great art from around the world. Madrid is also home to some of the most beautiful and historic architecture in the world and the broad sweep of this architectural history provides a glorious backdrop to city life. 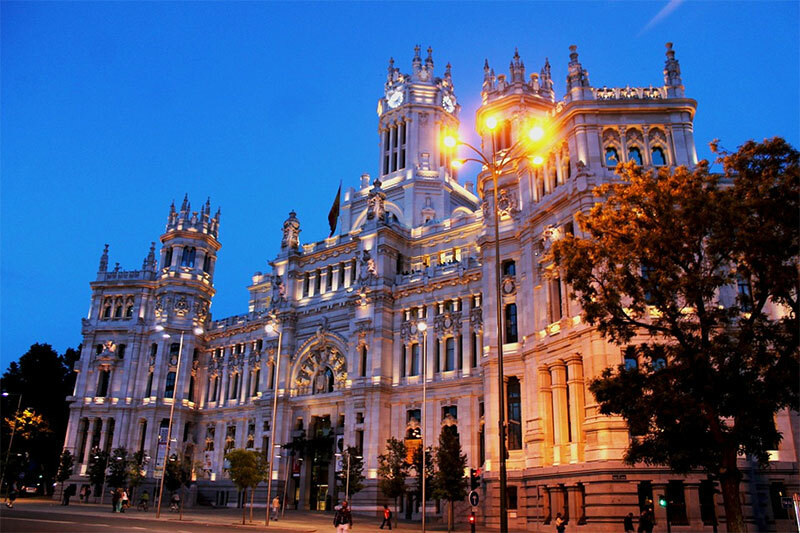 The wide range of architectural sights to behold while visiting Madrid include the city’s medieval mansions and royal palaces, the creative angles of Spanish contemporary architecture, the sober brickwork and slate spires of the Madrid baroque style and the extravagant Andalusian structures. Put simply, this is one majestic city in terms of architecture. One of the coolest places to visit in Madrid is the Plaza Mayor—a central meeting place for the citizens of this great city. The Plaza Mayor is a grand symmetrically-designed city square surrounded by elegant arcaded red brick buildings. Located in the heart of Madrid, this historic and famous square is filled with majestic statues and landmarks, and is home to many festivals and festivities, from bullfights to royal coronations. The Puerto de Alcala, or Alcala Gate, is another architectural masterpiece. The Gate, as it often known, was built in 1778 by the renowned Italian architect Sabatini. The neo-classical city gate stands in the Plaza de Indepencia and is one of Madrid’s best known symbols. Known familiarly as Retiro Park, the Parque del Buen Retiro, or Royal Park, is the most popular park in Madrid. Belonging to the Spanish monarchy until the late 19th century, this now public park is one of the premiere destinations in the city for rest and relaxation. Among its many admired features is a monument to King Alfonso XII, a massive memorial featuring a semicircular colonnade and an equestrian statue of the King atop a tall central core. Adjacent to the monument is the Estanque del Retiro, or “Retiro Pond,” an artificial lake that offers some much-appreciated cooling during the hot summer months in Madrid. Other popular features of the park include the old Mining building, locally known as the Palacio de Velázquez, built in 1884 by architect Ricardo Velázquez Bosco, who also designed one of the park’s other emblematic buildings, the Palacio de Cristal (Crystal Palace), a glass pavilion fashioned after the Crystal Palace in London. No section on Spanish cuisine would be complete without mentioning el tapeo and tapas. In scores of Spanish cities, towns and villages, including the capital city of Madrid, el tapeo, the practice of sampling various tapas at the local restaurants and especially the bars, is a friendly and widely practiced tradition. The observance usually takes place as people are getting off work for the day, and the tapas bars are a great way for residents and tourists to get together, socialize and, most importantly, stave off hunger pangs while waiting for the evening meal. Tapas, which translate literally to “small plates,” are small dishes of food, usually served free with the purchase of a drink. There are many different kinds of tapas to sample on any given night in a Spanish bar or restaurant, including small pieces of deep-fried fish and seafood, which are very popular in almost every region of the country. Some of the other favorites include olives, stuffed with cheese, anchovies or roasted bell pepper; Albondigas, or meatballs with sauce; Bacalao, salted cod loin sliced very thinly and usually served with bread and tomatoes; Carne Mechada, slow cooked pieces of tender beef; Chopitos, battered and fried tiny squid; and Frittatas, a tortilla containing vegetables and chorizo sausage. Many of these snacks are drenched with olive oil, garlic, hot chilies and other spices, and because fat is not used sparingly in Spanish cooking, it’s best to leave the calorie chart at home. Those looking to let loose and party during their stay will quickly discover that the nightlife in Madrid is truly the stuff of legend, and the perfect complement to the more sedate charms of its grand arts and fine dining. The city is absolutely loaded with after-dark hotspots—a collection of storied cocktail bars and nightclubs that combine a hint of glamour with non-stop action. Throughout its many neighborhoods and enclaves, guests of this great city will find themselves swept along on a tide of people, a blissful crowd intent on dancing until dawn. Every winter, a beer invasion explodes into the national capital of Spain, as the city rolls out its annual Madrid Beer Week, an event spanning roughly from November 21 to November 30 each year. With ten full days of activities and plenty of beer on hand to sample, this event is one that Madrilènes look forward to year after year. In addition to introducing a number of new Craft Beers, Madrid Beer Week features a bevy of activities and tastings at various locations throughout the city—activities that include informative workshops, expert presentations, pairing menus, cooking classes and more. More than 20 establishments throughout the city take part in this one-of-a-kind event, establishments that range from pubs and restaurants to shops and factories, with a range of activities that are guaranteed to please everyone in your group. Madrid Beer Week is an event sponsored by the city of Madrid and a number of local breweries, both large and small. Also sponsoring the event are the 20 locations in which the various activities of the festival take place. One of the largest and most influential sponsors of Madrid Beer Week is the famous Spanish brewery Casimiro Mahou. This brewery, which is also known as Grupo Mahou-San Miguel, is a Spanish brewing company, founded in Madrid in 1890 under the name of Hijos de Casimiro Mahou, fabrica de hielo y cerveza (The Sons of Casimiro Mahou, production of ice and beer). Mahou-San Miguel is the leading brand in the Spanish beer market. Las Fallas is one of Spain’s most impressive festivals. The event takes place each near the Mediterranean Sea. The celebration lasts for a week and includes nonstop fireworks and noisy fanfare. The southern city of Seville plays host to two of the largest celebrations of the year. The first of these is Semana Santa, a week of feasting and Roman Catholic processions leading up to Easter. The festivities include masked parades and enormous floats with Roman Catholic figures. This somber spectacle is followed up by La Feria de Abril, a much more joyous event, featuring hundreds of tents and amusement park rides, and locals dressed in traditional garb. La Fiesta de San Fermin is a celebratory and quite iconic holiday that takes place in the northern Spanish town of Pamplona. The festivities occur annually in mid-July. The most well-known feature of this celebration is the oft-publicized “Running of the Bulls,” an event first made famous by American author Ernest Hemingway in his novel The Sun Also Rises. Finally, there is La Tomatina, an all-out “tomato war” hosted by the town of Buñol, Spain, just outside Valencia. Tourists and locals alike gather here on the last Wednesday of August each year to stage a tomato-chucking battle of epic proportions. This event is part of a week-long festival in honor of Buñol’s patron saint.